Japan’s remaining fleet of 12 F-35As will remain grounded for the time being, according to the Japanese defense minister. 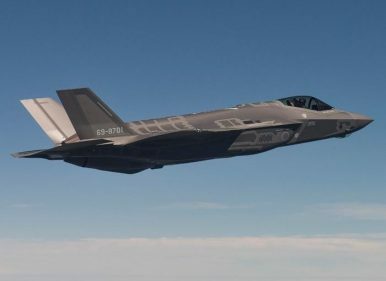 Japan’s Air Self-Defense Force (JASDF) announced in a statement that one of its fifth-generation Lockheed Martin Lightning II F-35A fighter jets has gone missing during a training mission off northern Japan on April 9. The F-35A, along with three other stealth fighters of the same type, took off from Misawa Air base for an air combat training mission at 7 p.m. on April 9. One aircraft reportedly disappeared from radar tracking systems at 7:27 p.m. Tuesday, Japan time, about 135 km (84 miles) east of Misawa Air Base, in the northern part of Japan’s main island of Honshu. JASDF aircraft, along with Japan Maritime Self Defense Force (JMSDF) and Japan Coast Guard (JCG) vessels, have begun a search mission. It is unclear whether the F-35A pilot was able to eject from the cockpit. Japanese Defense Minister Takeshi Iwaya said that the MoD “will put all our efforts to save the life [of the pilot] first,” according to The Japan Times. Additionally, the defense minister stated that all JASDF F-35As will remain grounded for the time being. The JASDF stood up its first F-35A fighter squadron, the 302nd Squadron, part of the service’s 3rd Air Wing, at Misawa Air Base last month. The unit consists of 13 F-35As. In January 2018, the JSDF deployed its first F-35A at the base. Japan selected the F-35A as the JASDF’s next-generation fighter aircraft in December 2011 with an initial order for 42 F-35As. In December 2018, the cabinet of Japanese Prime Minister Shinzo Abe approved an increase of Japan’s existing order of 42 to 147 F-35 aircraft, including an additional 63 F-35As and 42 F-35Bs, the short take-off and vertical landing (STOVL) variant of the aircraft. The JMSDF JS Izumo, the lead ship of the Izumo-class, is expected to be retrofitted to operate the F-35B from its flight deck. F-35Bs will also be deployed on Japanese islands along the edge of the East China Sea. Notably, Norwegian defense contractor Kongsberg Defense & Aerospace concluded an agreement in March with the MoD to provide “the initial deliveries” of next-generation, long-range, precision-guided Joint Strike Missiles (JSMs) for Japan’s F-35s. A crash would be the first time an F-35A has gone down. In September 2018, an F-35B crashed near the Marine Corps Air Station Beaufort in South Carolina in the United States, which led to a temporary grounding of the aircraft.